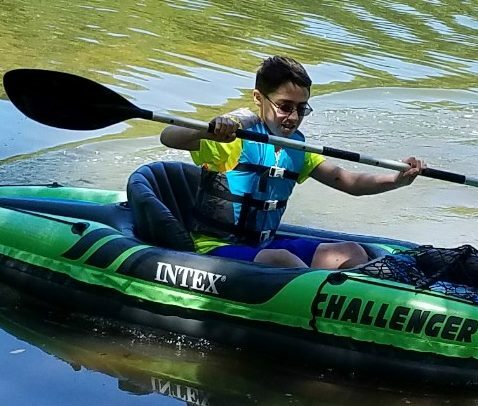 A little over a year ago I purchased the Intex Challenger K1 Inflatable Kayak and the Intex Explorer K2 2-Person Kayak for my family. I finally got to take them both out with my 13-year old son, my daughter, her husband and my 1 1/2 yr-old grandson. 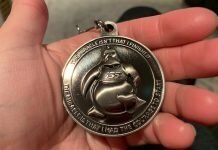 We had the time of our lives! 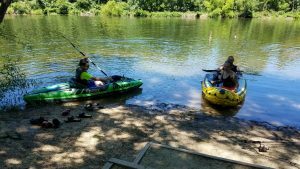 I had never owned a kayak myself but I had tried them before and enjoyed them but I wasn’t ready or able to dish out the big bucks to get a hard shell kayak, especially since we would need more than one. Intex kayaks are an affordable alternative to hard shells, especially for families because who wants to sit on the shore waiting their turn because you can only afford one hard shell kayak? They’re also a good alternative because of their portability. Once deflated, they can fit in the back of nearly any car. They also weigh less than 50 lbs, so you can bring them along as checked-on luggage for flights. So are these inexpensive inflatable kayaks worth buying? Well, I can just say that none of us wanted to leave when it was time to go! It was such a pleasant experience paddling around on the small pond we visited. My son was hesitant to try the K1 1-person kayak at first. He had some previous bad experiences with other boats and wasn’t too thrilled with the idea that I was taking him out to go kayaking but once he get in the kayak and began paddling, I had a hard time getting him to come back to shore. I was left standing on the shore while my son had the K1 and my daughter’s family had claimed the K2. Hey, that’s not fair! So, my son has some money saved and he’s going to get a Challenger K1 kayak for himself and he wants me to take him out again. 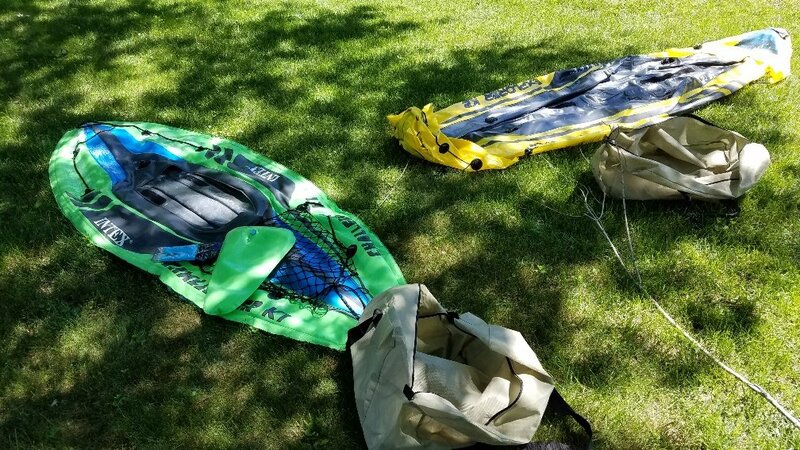 Both deflated and drying out in the sun in my front yard before I put them in their storage bags, and yes when folded correctly they actually fit in their bags! So, I had to stop at the store and buy another oar, which by itself cost almost as much as I paid for the K1. Of course, when I got back home I finally remembered where I had placed the box with all those missing pieces. Oh well, it was still a good time. I personally like the K1 Challenger design over the Explorer design. A 2-person Challenger kayak is also available on Amazon. What I liked about the Challenger is that it has a net on the bow to securely store items. However, what’s great about the K2 Explorer is that it has plenty of room for two people or possibly more. Since we took it out without the seats, there was enough room for two adults, my 13-year old son, and infant grandson. The K2 Explorer was extremely stable. I’m not sure how you could possibly tip it over on calm water. 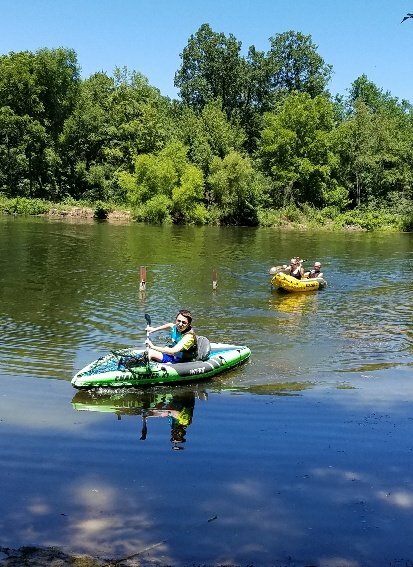 My son-in-law was able to jump in and out of it, literally stand up in it and rock it back and forth (I’m not saying you should) and even climb back in after swimming without the kayak tipping even the slightest. The K1 Challenger 1-person kayak that I was using was also stable but I sometimes felt like I could have tipped it over. If I had taken the seat out and sat lower in the kayak than I think it would be very difficult to tip it but then it would be more difficult to use the oar. The seat was surprisingly comfortable in the K1 Challenger. The bottom of the inflatable seat attaches by Velcro and there are two buckles that clip in to keep the back upright and stiff. It worked fine. Of course, I had plenty of leg room since I’m only about 5’1″ tall but there was room to spare. I think a much taller person could fit well. Steering the K1 with the paddle went smoothly most of the time. I did a couple races with my daughter and I got the K1 going at a good speed and then it spun in a different direction instead of continuing to go straight. 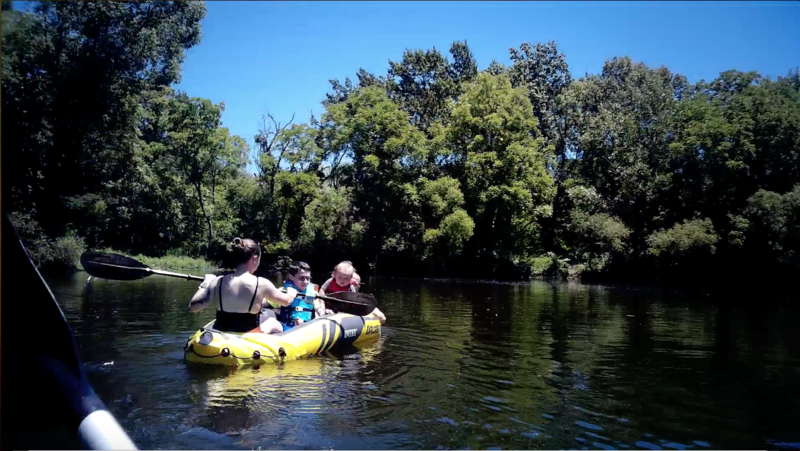 This happened a few times with me and when my son was paddling it but that might be because both of us are inexperienced kayakers but it’s probably due to the fact that it lacks the stabilizing skeg that the Explorer is equipped with. The K2 Explorer tracks more in a straight line because it does have a detachable fin (called a skeg) that slides on the bottom of the kayak. You just have to remember that it is there when you’re in shallow water! We didn’t have any trouble with it but reading through other reviews, some people have lost theirs. Below is a video of my son trying out the Intex Challenger K1 Kayak. This was his first experience paddling a kayak. Inflating and deflating the kayaks was easy and didn’t take much time. Next time it should go even more quickly since we’ll know exactly what to do. We’re going to be taking these out for sure several more times and getting another K1 Challenger for my son to use. 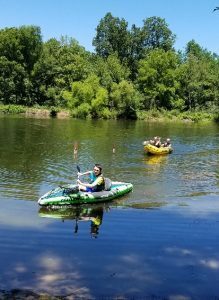 I just wanted to share our experience because I think a lot of families would enjoy having these kayaks. They’re probably more suitable for lakes and calm water. They are made out of heavy duty puncture-resistant vinyl but I would avoid sharp rocks for obvious reasons. There are many glowing reviews on Amazon for both of these models and for good reason. They’re relatively inexpensive, get the job done, and are a lot of fun for families to enjoy. We can’t wait to get out again with them!